Addressing alcohol harm matters – for children and youth, for people who need a second chance, for families, communities, for workplaces and companies, for public health and social fabric, for sustainable development and for society’s prosperity and well-being at large. Therefore, we in IOGT International work hand in hand with decision-makers and opinion leaders around the world. This page provides a comprehensive legislator’s tool box to advice on and help facilitate high-impact, cost-effective and evidence-based policy-making to prevent and reduce harm caused by alcohol. Social determinants of health are among the root causes of the level and distribution of alcohol-related harm in a given community or society. Environments determine whether individuals take up tobacco, use alcohol, have poor diets, and engage in physical activity. Behavioural factors such as tobacco use, alcohol use, diet, or physical exercise are certainly crucial determinants of health, as the Draft Discussion paper for the Commission on Social Determinants of Health, April 2007, states. 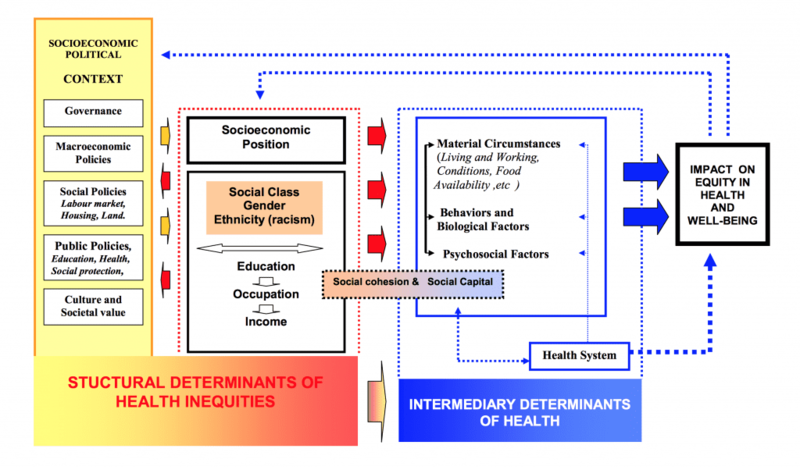 The framework shows how social, economic and political mechanisms give rise to a set of socio-economic positions, whereby populations are stratified according to income, education, occupation, gender, race/ethnicity and other factors; these socio-economic positions in turn shape specific determinants of health status (intermediary determinants) reflective of people’s place within social hierarchies; based on their respective social status, individuals experience differences in exposure and vulnerability to health-compromising conditions. Alcohol use and related harm is an intermediate social determinant of health. To tackle structural as well as intermediary determinants requires intersectoral policy approaches – which is why the AiAP approach is crucial. Alcohol harm causes health inequalities and is in turn greater in lower socio-economic groups. There is higher prevalence of alcohol harm in lower socio-economic groups, particularly in richer countries. Evidence is limited on the distribution of alcohol harm in low- and middle-income countries. Existing evidence suggests that alcohol harm is more prevalent in lower socio-economic groups and more prevalent among men than among women. In 2010, alcohol use was the third leading risk factor for overall disease burden among men. In comparison, it was the eighth leading risk factor for disease burden among women. IOGT International holds that the following ten principles should guide the development and implementation of policies at all levels. These principles reflect the multifaceted determinants of alcohol-related harm and the multisectoral actions required to implement effective and high-impact interventions. The general level of alcohol consumption in a population, patterns of alcohol use and local contexts determine the level of harm cau- sed by alcohol. The amount of alcohol related problems in a society is linked to the total alcohol consumption within that society. Attempts to prevent and reduce alcohol related harm should therefore be aimed at re- ducing the total consumption of alcohol. Evidence-based alcohol policy measures directed at population le- vel are especially high-impact and cost-effective. Because of two effects: 1) they protect the user and 2) they protect people other than the alcohol user and specific populations that are at particular risk of alcohol harm, such as children, adolescents, women, especi- ally women of child-bearing age, pregnant and breastfeeding wo- men, indigenous people, and other minority groups or groups with low socioeconomic status. These alcohol policy measures save lives and financial resources and therefore contribute to development and well being of the whole society. A substantial scientific knowledge base on the impact and cost-effectiveness of strategies and interventions to prevent and reduce alcohol harm does exist and is available to policy-makers. Although much of the evidence comes from high-income countries, the results of meta-analyses and reviews provide sufficient knowledge to inform policy recommendations in terms of comparative effectiveness and cost-effectiveness of selected policy measures. Health and well being is a Human Right. Without health and well being all other goals of public policy making remain out of reach. Therefore IOGT International reaffirms guiding principle d) of the WHO Global Alcohol Strategy that public health should be given proper deference in relation to competing interests and approaches. Public health and community safety should be given priority in all public policy-making concerning alcohol. Public policies and interventions to prevent and reduce alcohol-related harm should be guided and formulated by public health interests and be based on clear public health goals as well as the best available evidence. More than half of the world’s adult population (58%) chooses to live free from alcohol. In the most populated countries of the world the percentage of people choosing to live alcohol free is even bigger. For example, 80% of the women in India do not use alcohol. The amount of people living free from alcohol is of crucial importance for the health and well being of societies and the global population. It is fundamental for reducing the global burden of disease, for controlling and preventing the epidemic of Non-communicable disease and the epidemic of gender-based violence. Therefore, IOGT International reaffirms guiding principle g) of the WHO Global Alcohol Strategy that children, teenagers and adults who choose not to use alcohol beverages have the right to be supported in their choices to live free from alcohol and be protected from pressures to use alcohol. That all those people who want to can have the choice to live free from alcohol is a crucial aspect of global health promotion and is decisive for sustainable development. The principle of disinterest means that particular profit interests have to be kept out of the alcohol trade. This can be done, for instance, by policies regulating import, production, distribution and retail of alcohol and alcohol marketing. There is a fundamental conflict of interest at work: people’s rights to live free from alcohol should be protected, and people’s rights to health and well being should be protected and promoted, but at the same time the alcohol industry has an economic interest in the opposite. The alcohol industry is obliged to maximize profits for its shareholders. Its products are harmful. These profit interests stand contrary to society’s interest in improving public health, fostering societal development and building a sustainable economy and well-functioning democracy. Due to this conflict of interest the alcohol industry has no role to play in public policy making on any level. Alcohol’s Harm to Others is a Human Rights issue and a threat to the social fabric of any society. Examples for alcohol’s Harm to Others are: child abuse, domestic and intimate partner violence, accidents, public damage, inequity, opportunity costs, and poverty. Therefore IOGT International reaffirms guiding principle e) of the WHO Global Alcohol Strategy that the protection of populations at high risk of alcohol-attributable harm and those exposed to the negative effects of alcohol use by others should be an integral part of policies seeking to prevent and reduce alcohol harm. Harm To Others signifies a total failure and collapse of the “alcohol market”. The price of alcoholic products does not come near the real costs that alcohol use burdens society with. The most effective and sustainable outcomes of policy interventions for preventing alcohol harm are achieved by the prevention triangle, where control policies are combined with mobilization efforts and education methods. Applied together these three dimensions form one holistic approach tackling the alcohol problem in society and preventing alcohol related harm. Control policies mean evidence-based, high-impact, cost-effective policy measures and interventions into the alcohol market by governments and other decision-makers. Education methods mean generating relevant research about alcohol harm in society and training of professionals, education of consumers, parents, teachers and youth as well as campaigns to raise awareness, challenge, motivate and raise the level of know-how concerning alcohol harm and healthy lifestyles among the broader public. Mobilization means to strive for making alcohol prevention a part of the agenda for social and political movements, link the alcohol issue to other key policy issues (Alcohol in All Policies) and involve leadership and members of civil society on all levels. AiAP – Alcohol in All Policies is the comprehensive and integrated approach to effectively and sustainably prevent and reduce alcohol harm on local, national, regional and global level. Prevention of (alcohol) harm is a human rights imperative and a fundamental task of any government. Prevention is also smart economics. The primary objective of prevention is to help people, particularly but not exclusively young people, to avoid or delay the initiation of the use of alcohol and other drugs. The general aim of prevention, goes beyond that objective: it is the healthy and safe development of children and youth to be able to live up to their full potential and becoming active members of their community and society. Therefore, IOGT International highlights and re-emphasizes the moral imperative of decision-makers to utilize prevention methods. This is also smart and sustainable economics: For every dollar spent on prevention, at least ten can be saved in future health, social and crime costs. Alcohol harm is not a minor problem of a small minority. It’s a problem cutting across the entire population. Evidence shows however that it is the ”normal” or “regular” alcohol user who causes the biggest alcohol harm, in terms of social, economic and public health impact. Their exposure to alcohol has long-term consequences for their health and well being. It is also the case that the alcohol industry earns its biggest profits from the so-called ”regular users”. The prevention paradox explains therefore, that the biggest prevention impact is achieved when alcohol policies aim at the entire population and not only at the group with alcohol use disorders and addiction. Alcohol is a highly addictive substance. Alcohol use can lead to addiction. Addiction is an illness that affects addicts on all levels of their lives: Physically, mentally, socially and economically. The disease of addiction can be treated, which opens the possibility to most of the addicted people of a dignified life, free from alcohol, reintegrated in society and actively participating in their communities. Therefore, IOGT International highlights and re-emphasizes the moral imperative for society to invest in treatment and rehabilitation and support addicts on their way back into society. These efforts are important for the addicts themselves but also for their communities, their closest family and relatives, colleagues and co-workers, and friends. Evidence-based treatment and rehabilitation measures can thus unfold a preventive effect, for example considering children of alcoholics. The “Best Buys” interventions to prevent and reduce alcohol related harm are well documented in scientific research as cost-effective, high-impact and evidence-based measures. The strongest, most cost-effective strategies include among others restricting the affordability of alcohol, e.g. through taxation that increases prices; restrictions on the physical availability of alcohol, e.g. through promoting alcohol free environments especially for children and youth; and alcohol marketing restrictions, e.g. bans of alcohol advertising. The WHO Global Alcohol Strategy represents a collective commitment by WHO Member States to reduce the global burden of disease caused by alcohol consumption. The strategy includes evidence-based policies and interventions that protect health and save lives if adopted, implemented and enforced. Sustainable action requires strong leadership and a solid base of awareness and political will and commitment. The commitments should be expressed through adequately funded comprehensive and intersectoral national policies that clarify the contributions, and division of responsibility, of the different partners involved. The policies must be evidence-based, rights-based and tailored to local circumstances, with clear objectives, strategies and targets. The policy should be accompanied by a specific action plan and supported by effective and sustainable implementation and evaluation mechanisms. The appropriate engagement of civil society is crucial. Conflict of interest that arise from involving the alcohol industry need to eliminated. Raising awareness of harm to others and among vulnerable groups caused by alcohol use, avoiding stigmatization and actively discouraging discrimination against affected groups and individuals. Health services are central to tackling harm at the individual level among those with alcohol-use disorders and other health conditions caused by alcohol use. Health services should provide prevention and treatment interventions to individuals and families at risk of, or affected by, alcohol-use disorders and associated conditions. Health services response should be sufficiently strengthened and funded in a way that is commensurate with the magnitude of the public health problems caused by alcohol harm, and in order to be able to reach out to communities to provide services, inform and raise awareness of alcohol-related harm. Establishing and maintaining a system of registration and monitoring of alcohol- attributable morbidity and mortality, with regular reporting mechanisms. The impact of alcohol harm on communities can trigger and foster local initiatives and solutions to local problems. Communities can be supported and empowered by governments and other stakeholders to use their local knowledge and expertise in adopting effective approaches to prevent and reduce alcohol harm by changing collective rather than individual behaviour. Developing or supporting community programmes and policies for subpopulations at particular risk, such as young people, unemployed persons and indigenous populations, specific issues like the production and distribution of illicit or informal-alcohol beverages and events at community level such as sporting events and town festivals. Public health strategies that seek to regulate the commercial or public availability of alcohol through laws, policies, and programmes are important ways to reduce the general level of alcohol use and harm. Such strategies provide essential measures to prevent easy access to alcohol by vulnerable and high-risk groups. Commercial and public availability of alcohol can have a reciprocal influence on the social availability of alcohol and thus contribute to changing social and cultural norms that promotes harmful use of alcohol. In some low-and middle-income countries, informal markets are a major source of alcohol and formal controls on sale need to be complemented by actions addressing illicit or informally produced alcohol. Secondary supply of alcohol, for example from parents or friends, needs also to be taken into consideration in measures on the availability of alcohol. Adopting policies to reduce and eliminate availability of illicit production, sale and distribution of alcoholic beverages as well as to regulate or control informal alcohol. Reducing the impact of marketing, particularly on children, young people and adolescents, is an important consideration in preventing alcohol harm, early onset of alcohol consumption and the reduction of overall alcohol use and related harm. Marketing could refer, as appropriate and in accordance with national legislation, to any form of commercial communication or message that is designed to increase, or has the effect of increasing, the recognition, appeal and/or consumption of particular products and services. It could comprise anything that acts to advertise or otherwise promote a product or service. Alcohol is marketed through increasingly sophisticated advertising and promotion techniques, including linking alcohol brands to sports and cultural activities, sponsorships and product placements, and new marketing techniques such as e-mails, SMS and podcasting, social media and other communication techniques. The transmission of alcohol marketing messages across national borders and jurisdictions on channels such as satellite television and the Internet, and sponsorship of sports and cultural events is emerging as a serious concern. It is very difficult to target young adult consumers without exposing cohorts of children and adolescents under the legal age to the same marketing. The exposure of children and young people to alcohol marketing is of particular concern, as is the targeting of new markets in developing and low-and middle-income countries with a current low prevalence of alcohol consumption or high abstinence rates. Both the content of alcohol marketing and the amount of exposure of young people to that marketing are crucial issues. A precautionary approach to protecting young people against these marketing techniques should be considered. Setting up effective administrative and deterrence systems for infringements on marketing restrictions. Consumers, including heavy alcohol users and young people, are sensitive to changes in the price of alcohol products. Pricing policies can be used to reduce underage alcohol consumption, to halt progression towards consuming large volumes of alcohol and/or episodes of heavy use, and to influence consumers’ preferences. Increasing the price of alcoholic beverages is one of the most effective interventions to reduce alcohol use and related harm. A key factor for the success of price-related policies in reducing alcohol use is an effective and efficient system for taxation matched by adequate tax collection and enforcement. Factors such as consumer preferences and choice, changes in income, alternative sources for alcohol in the country or in neighbouring countries, and the presence or absence of other alcohol policy measures may influence the effectiveness of this policy option. Demand for different beverages may be affected differently. Tax increases can have different impacts on sales, depending on how they affect the price to the consumer. Stopping subsidies to economic operators in the area of alcohol. Alcohol-impaired driving is a significant public health problem that affects both the alcohol user and in many cases innocent parties. Strong evidence-based interventions exist for reducing driving under the influence of alcohol. Strategies to reduce harm associated with driving under the influence of alcohol should include deterrent measures that aim to reduce the likelihood that a person will drive under the influence of alcohol, and measures that create a safer driving environment in order to reduce both the likelihood and severity of harm associated with alcohol-influenced crashes. In some countries, the number of traffic-related injuries involving intoxicated pedestrians is substantial and should be a high priority for intervention. Conducting public awareness and information campaigns in support of policy and in order to increase the general deterrence effect.. Consumption of illicitly or informally produced alcohol could have additional negative health consequences due to a higher ethanol content and potential contamination with toxic substances, such as methanol. It may also hamper governments’ abilities to tax and control legally produced alcohol. Actions to reduce these additional negative effects should be taken according to the prevalence of illicit and/or informal alcohol consumption and the associated harm. Good scientific, technical and institutional capacity should be in place for the planning and implementation of appropriate national, regional and international measures. Good market knowledge and insight into the composition and production of informal or illicit alcohol are also important, coupled with an appropriate legislative framework and active enforcement. These interventions should complement, not replace, other interventions to reduce alcohol use and related harm. Production and sale of informal alcohol are ingrained in many cultures and are often informally controlled. Thus control measures could be different for illicit alcohol and informally produced alcohol and should be combined with awareness raising and community mobilization. Efforts to stimulate alternative sources of income are also important. Issuing relevant public warnings about contaminants and other health threats from informal or illicit alcohol. Data from monitoring and surveillance create the basis for the success and appropriate delivery of the other policy options. Local, national and international monitoring and surveillance are needed in order to monitor the magnitude and trends of alcohol-related harms, to strengthen advocacy, to formulate policies and to assess impact of interventions. Monitoring should also capture the profile of people accessing services and the reason why people most affected are not accessing prevention and treatment services. Data may be available in other sectors, and good systems for coordination, information exchange and collaboration are necessary in order to collect the potentially broad range of information needed to have comprehensive monitoring and surveillance. Development of sustainable national information systems using indicators, definitions and data-collection procedures compatible with WHO’s global and regional information systems provides an important basis for effective evaluation of national efforts to reduce harmful use of alcohol and for monitoring trends at subregional, regional and global levels. Systematic continual collection, collation and analysis of data, timely dissemination of information and feedback to policy-makers and other stakeholders should be an integral part of implementation of any policy and intervention to reduce alcohol use and prevent alcohol harm. Prevention is an essential policy cornerstone for a child-centerer approach to public policy making. IOGT International and our 122 Member Organisations stand for a Child Rights-centered approach to prevention of illicit drug-related harm. The primacy and universality of children’s Best Interest means that general alcohol policy-making shall be child centered – as opposed to adult-centered or user-centered. Therefore we emphasise the importance of alcohol free environments to protect children and advocate passionately for the creation of many more alcohol free environments for children and young people. The wording of CRC Art. 3 and Art. 33 stipulates a broad scope of protection. Governments should make solid efforts to prevent alcohol harm. Governments must create enabling environments for protecting children from alcohol harm. For this to happen the most conducive policy goal is to ensure an alcohol-free childhood. Special protection levels stipulated by the CRC endow the protection of children from alcohol harm with a high value in itself. Art. 33 is one of the special protection articles in the CRC. This means that it represents a value that shall be upheld. The child shall be protected from harm. This can be compared to the right not to be subjected to discrimination. Policy-making that is not embracing this value is not consistent with the CRC. Art. 3, CRC and its Best Interest Principle have far reaching implications. They go beyond the child-only realm. The best interest of the child shall be a primary consideration in all policy making that affects children, even in areas which at first might seem to have nothing to do with children. In the field of alcohol policy-making the question “how does this affect children’s right to protection from alcohol harm” shall be mainstreamed. It shall be the starting point for all alcohol-related discussions to consider: ”Is this the best way to ensure that children are protected from alcohol harm? If the answer is no the policy needs to be re-thought. UNICEF’s Child Protection Strategy 2009 determines prevention as the first priority for child protection. The starting point in a child-centered policy approach must be prevention.